​I have always been fascinated by the music used in film and the people who created it. I think the scores that made the greatest impression on me at the start were the Errol Flynn swashbucklers, with music by Erich Wolfgang Korngold – Captain Blood, The Adventures of Robin Hood, and The Sea Hawk. I’ve always loved the main them Korngold created for The Prince and the Pauper, which he eventually rolled into his Violin Concerto in D. In the same piece, he quoted themes from 3 other films he scored: Another Dawn, Juarez, and Anthony Adverse. I always wondered what kind of works they would create away from the confinements of a film. I was curious of their versatility. I believe it has only been recently that these composers are being recognized and given more credit for their artistic abilities and creativity. I found in nearly every case, that these composers were well-trained, often very sophisticated musicians. For me, Korngold’s work inspired me to look into the work of other film composers. I learned about Miklos Rozsa, Alex North, Franz Waxman, and Bernard Hermann. I learned about the contributions to film music of some of the biggest names in music for the concert hall: Leonard Bernstein, Aaron Copland, Georges Auric, Malcolm Arnold, William Walton, and John Corligiano. Even Benjamin Britten, Dimitri Shostakovich, and Serge Prokofiev wrote scores for film. Miklos Rozsa taught classes in film composition. Ironically, John Williams was one of his students. variety of musical genres and styles. Some familiar songs of the season will include, “Welcome Christmas,” from the film,” The Grinch Who Stole Christmas”; “The Pretty Little Dolly,” which was first performed by Mona Aboud on the Tonight Show in 1962; and we will close with the medley from the film “Home Alone.” In anticipation of its 200th anniversary, we will also perform the traditional carol, “Silent Night,” as arranged by William Ferris. ​There were ten seasons of exploring and research, resulting in unique, enterprising, and amazing music, along with perceptive, energetic, musical, and convincing performances! We introduced new music and looked at the “other sides” of some established composers. Who would have thought that songwriters such as Harry Warren and Meredith Willson would have written Catholic Masses; or that “The March King,” John Phillip Sousa, would have written a “Te Deum”; or that Charles Strouse (Annie, Bye Bye Birdie) would have studied with the great pedagogue, Nadia Boulanger, and would have written a psalm setting for a cappella chorus? 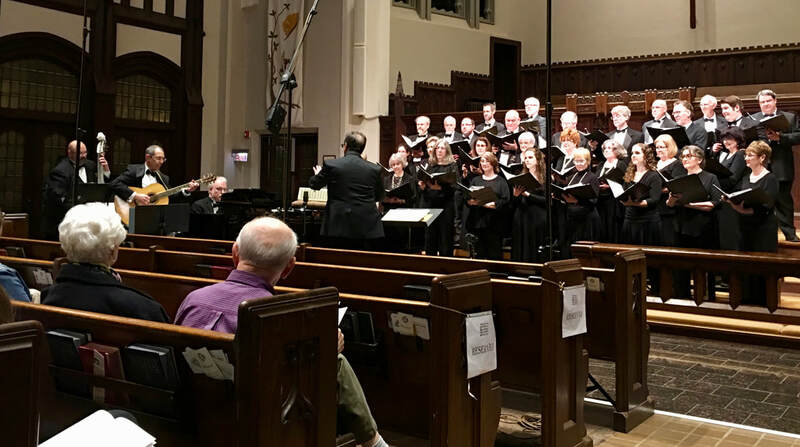 When was the last time a vocal ensemble programmed the two cantatas written by the orchestrator of the works of Kern, Gershwin, and Rodgers – Robert Russell Bennett? When and where was there ever a concert dedicated to 17 woman composers? To black composers, from Colonial times to the present? ​None of this would have been possible without the dedication and commitment to the organization’s vision by the founding members, the MTS Board and, especially, the singers – past and present. ​The Michael Teolis Singers reached the point a while ago that the organization needs to go beyond being one of the area’s best kept secret. In the coming seasons, we hope to continue to explore – in order to present – unique material and bring to the audience music that is accessible and should be in the mainstream repertoire. After ten years, we will be doing some reprises of selections we already introduced, in addition to some more “hidden gems.” Our themes will continue to be innovative. We will continue to educate, but always keeping in mind our main job is to entertain. We have come a long way, but there’s still so much to look forward to. ​We began the celebratory season with a “Brassy Christmas,” presenting some traditional favorites dressed up with brass, percussion, and organ: Ovid Young’s “A Christmas Intrada”; the David Willcocks arrangement of “O Come All Ye Faithful”; Ferris’s “The Lord Said to Me”; and the Teolis arrangements of “The Sussex Carol (On Christmas Night)”; “Joy to the World”; and “We Wish You a Merry Christmas.” The Daniel Pinkham “Christmas Cantata” added a wonderful centerpiece to the Holiday musical festivities. As always, we try to include premiers and special presentations. For this concert, there were arrangements that were presented for the first time, including the Midwest premier of H. Leslie Adams’ “There Was an Old Man” and an arrangement of Allan Sherman’s “Hello Mudduh, Hello Faddah,” as arranged by yours truly. Fun fact: we were able to procure permission from Robert Sherman, the son of Allan Sherman. I was only able to track down the copyright owner after going to the ASCAP site and typing in “Hello Mother, Hello Father,” after several tries of typing in “Hello Mudduh, Hello Faddah.” Allan Sherman, by the way, was a Chicago boy, born on the near north side of the City. The full ensemble presented arrangements of Tom Lehrer’s “Poisoning Pigeons in the Park” and “Pollution,” among many others, including a rollicking version of “Zombie Jamboree,” which closed the program. There was sort of a coda to the season, as MTS was specially invited to perform at the annual Thomas A. Dorsey Commemoration, which was held at Pilgrim Baptist Church, 3300 S. Indiana, on Chicago’s south side. Pilgrim Baptist Church is the birth place of Gospel Music. This style of music was introduced and developed by Thomas A. Dorsey, author of the well-known hymn “Precious Lord, Take My Hand, which, by the way, was the favorite hymn of Dr. Martin Luther King, Jr. It was also performed at King’s funeral. This was the second time in the past three years MTS was invited to the Dorsey Celebration. What will the next ten years hold for us? Please check our website for our plans for the coming season and for any special events or announcements. The evening was truly historic. We presented the choral music of 17 women composers. We were fortunate and most grateful to have present as our guests some composers whose works we performed: Lita Grier, Lena McLin, and Regina Harris Baiocchi. We were also thrilled to have as our guest, Mr. Aaron Gandy, who is the Artistic Advisor for the Kay Swift Memorial Trust and who flew in specially to join us for the concert. Our performance of “God Is Our Refuge,” which was written by Kay Swift, was the world premiere. We feel honored to have been given the opportunity by Katharine Weber and Mr. Gandy to introduce the work. The program included a variety of sounds and styles that demonstrated the versatility and range of our organization. What a wonderful end to an amazing season that included magnificent performances of more uncovered gems, more world premieres, and rediscoveries of some remarkable composers. There is more to come as we plan for our astonishing 10th season.